I had a pound of ground lamb that I wanted to try something different with. I found a recipe I changed around to make this. They were easy to make and delicious. Place lamb in large bowl. Sprinkle garlic and salt over. Gently toss lamb with garlic, salt, feta and mint to blend. Divide lamb into 6 equal patties. Heat olive oil in heavy large skillet over medium heat. Cook lamb sausages until browned on both sides and cooked to desired doneness, about 6 minutes per side for medium. Serve hot and enjoy! I love lamb! 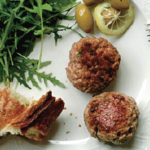 Great idea for these patties, I bet the feta and mint tasted awesome! Yes! The feta and mint added a wonderful flavor.